I just wanted to make a usable, straightforward FM synthesizer that can be easily fumbled around with to create sounds. Also, it would be nice to have some low-pass filtering to supress some of the harsh harmonics that often come with FM. The central panel of FUMB is organized in four rows. Each row corresponds to one sine wave oscillator and all possible modulations that can be applied to it. In the left part of each row, the oscillator’s amplitude, key velocity, pitch and envelope are adjusted. In the central part is the FM matrix, where each oscillator is modulated by the other oscillators and by itself. To the right of the FM matrix, the amount of FM to each oscillator (NOT its pitch or its amplitude) is modulated by a central LFO which is adjusted by the controllers at the panel top. There, the LFO rate is adjusted and can be synced to the host tempo. The LFO envelope is a ramp envelope with two parameters, the delay time and the tempo of the fade-in. 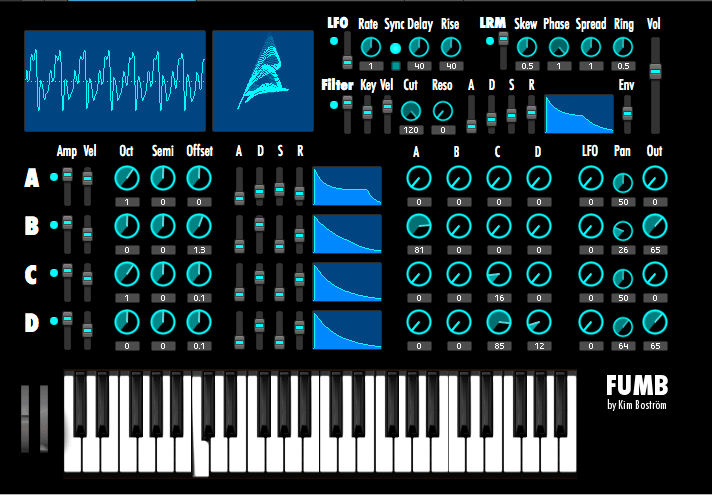 Note that the LFO envelope amplitude is overridden by the mod wheel. At the wheel’s zero position, the LFO is completely controlled by the LFO envelope. By cranking up the mod wheel, you increase the LFO modulation amount. Finally, the rightmost two columns of each oscillator’s row set its panorama and output volume. The total FM signal is fed into the effect section at the panel top next to the LFO settings. First, an envelope-controlled low-pass filter is applied to the signal. You can remove some harsh harmonics or create some subtractive-style sounds. Next, a peculiar stereo effect, the „LR Mangler (LRM)“, is added that, roughly, sums and multiplies each voice with an inverted, phase delayed copy of itself. Beside creating a nice stereo effect, the integrated ring modulator adds some harmonics to the sound. The result of the LR Mangler should be supervised in the phase correlation display. The parameters of the LR Mangler should be tweaked so that the displayed sound spreads into both dimensions of the display, giving a pleasant stereo image. For those who are more familiar with frequency ratios instead of octaves and semitones, there is a converter tool in the panel’s B view. Note that the „Offset“ knob sets an absolute detuning, while the „Oct“ and „Semi“ knobs detune by an amount relative to pitch of the key pressed.